Regular Those Were the Days reader John Norris, from Gillingham, has been tracing his family history and found a variety of relatives in the Deal and Walmer area. Whilst researching one name Alfred Norris, a tinman and gasfitter of Middle Street, John uncovered the following article in the Deal and Walmer Telegram for 1st October 1881. 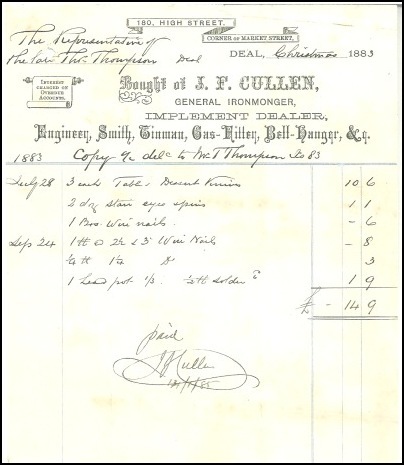 “As far as we are able to glean the particulars, a young workman named George Norris, employed in the establishment, went into the cellar to get a false bottom for a range, without the knowledge or consent of Mr Cullen, and took with him a small benzoline lamp which had recently been trimmed, during which some of the spirit was spilled on the outside of the lamp. “Mr Cullen’s dwelling house and shop is on the opposite side of the street, the whole of the glass in the windows was blown in on that side of the house and the windows of the High Street front were blown out. The shop of Mr Coppin has sustained material damage in the loss of four of the large plate glass squares of his shop front. Mr Redman, landlord of the Providence Inn, next door to the burning premises, also suffered from broken glass and breakage of bottles of spirits. Mr Browning, landlord of the Druids Arms has sustained considerable damage from the concussion … Mr Cambourn, butcher, is also a sufferer, every pane on the Fish Market side being demolished and sashes broken – the family were sitting down to dinner, when Mrs Cambourn’s spectacles were blown from her face and her cap from her head. The spectacles were afterwards found in Mr Hill’s front garden on the other side of the street…” This was possibly John Hill, bootmaker, of 4 Market Street. A further entry in the paper for 26th November 1881 read “Notice: Alfred Norris, tinsman and gasfitter, for some years past in my employ has this day been discharged by me. Also, George Norris, son of the above (cause of my warehouse being burnt down) has not since been employed by me. J F Cullen, Ironmonger 180 High Street, Deal.” George Norris went on to become licensee of the Deal Hoy.